Aside from the singles Romeo, Jus 1 Kiss, Where's Your Head At and Do Your Thing which are fantastic instantly recognisable tracks, the rest of the album fell short for me with very average offerings on the other tracks on this album. The Jaxx boys bring on <I>Rooty</I>, their second album, and it shares the same strengths as <I>Remedy</I> (catchy melodies, great hooks, infectious grooves) as well as the same weaknesses (aimless filler). “Romeo” and “Breakaway” start off the album on the right foot, only to be thrown way off course by “SFM” –- a pointless track. Things pick back up with “Jus 1 Kiss,” a bouncy, joyous song. The whole album seems to go like that: one or two great songs, followed by a not-so-good track (for instance, “Get Me Off” and “Where’s Your Head At” followed by “Crazy Girl”). Basement Jaxx are both eclectic (a good thing) and inconsistent (a bad thing). On the whole, though, the better songs bear repeated listens. An album that is not only dancey, but good for headphone listening as well. Rooty is a house album w/ many influences. "Romeo" the first track, is probably my favourite and is also the perfect intro.. a bittersweet song with an infectious beat. "Breakaway" is an awesome track as well, mixing minimal house with a rolling bass line and lyrics about escaping makes this one of my anthems. The rest of the CD makes its way through many genres and is entertaining the whole way through. 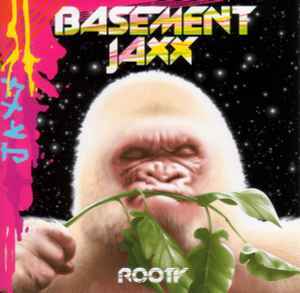 (although "SFM" is my least favourite track, it is still way ahead of many of the other house producers out there) Go see Basement Jaxx in "concert" if you want to truly experience this CD! "rooty" goes a step further than "remedy" direction P-funk. The first five tracks are excellent examples how to mix house and dnb with a P-funk attitude, and also make good songs. then the record goes slowly down. they lose the straightness, wander in beats and samples and couldn't find the way back, and in the end you'll be disappointed. but still they got potential.